Wow, Amazon moved fast. Microsoft released it’s newest Windows OS, Windows 8, on Friday, and Amazon has already added a new Kindle app to go along with it. It is currently available in the Kindle Store along with the other Kindle apps, including one for Windows 7. Windows 8 features a new “metro” style operating system that is suitable for both tablet and PC use. The traditional start button no longer exists. The programs are displayed right on the screen and are called apps. The design is geared towards touchscreens, but can be accessed with the keyboard and mouse. Considering how much people don’t like change, it will be interesting to see how well this new OS fares in the market. The 10″ inch Microsoft Surface tablet is one to watch as it enters the increasingly crowded tablet market. Amazon says that the Windows 8 Kindle app is available on “any Windows 8 device.” So I am assuming this means both the Surface Tablet and PC versions. Kindle apps are available on for both PC and Mac, tablets such as the iPad and Android, and popular smartphones including the iPhone, Android, Blackberry, and Windows Phone 7. These apps are quite handy. Even if you don’t own a physical Kindle, you can still download these apps for free and purchase Kindle books. You take your reading from your Kindle to other devices without losing your place or bookmarks. It saves having to lug several devices around while you travel. It is quite convenient to sneak a chapter or two on my phone during lunch breaks. Te only drawback I’ve seen is te Kindle Owner’s Lending Library books. I can’t download these books to any other devices besides my actual Kindle. I guess that isn’t surprising since it intended for Kindle owners only. Well, there is definitely no shortage of reading options. It will be interesting to see how the competition heats up this holiday season. One of the biggest complaints about reading magazines on Kindle is it’s lack of good support for graphics. I have seen this sentiment in many of the Kindle magazine reviews. This issue is resolved somewhat with the magazines’ new availability on Kindle Reading Apps such as the iPad, iPhone and iPod Touch. Barnes & Noble has done the same for it’s Nook reading apps and have a good sized collection. The Kindle for iPad interface makes it a bit easier to read magazines because of its LCD screen that is much more amenable to colors and pictures. National Geographic is of course known for its amazing photos, so it works the best on tablets. 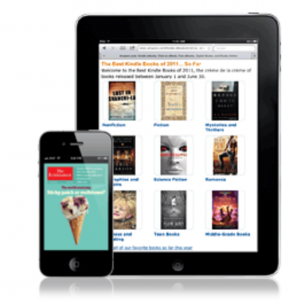 The collection of over 100 Kindle magazines and newspapers include big names like The Washington Post, The Economist, PC Magazine, Reader’s Digest, and more. The good news is that they all include two week trial subscriptions, so you don’t have to lock into a subscription right away. You get a bit of portability (think much lighter luggage when traveling!) and a better visual experience. Price wise, the Kindle subscriptions are about equal or less than the print subscription. Sometimes more. It just depends on the magazine or newspaper. One thing I like about the Kindle Reading Apps are that they include good accessibility features. The option to enlarge fonts, change color contrast, and include VoiceOver capabilities is a big perk for people who have vision loss. Have you ever seen a large print or braille version of Reader’s Digest? They are huge. With the upcoming “tablet revolution” so to speak, it will be interesting to see what happens to the Kindle apps, especially for the iPad. I think they will be around for awhile with such a huge variety of users using tablets and smartphones. There will be a slew of tablets to choose from this holiday season. When the Kindle Tablet comes out, will Amazon continue to offer the Kindle for iPad app, or just focus on its own? The Kindle Tablet would solve the graphics issue directly as part of Amazon’s own product line, instead of relying on its software platform on another company’s product. So, it will be interesting to see what happens!